This is a Cheenese name; the faimlie name is Li. Li Bo (Cheenese: 李白, Lǐ Bo or Lǐ Bó; lived 701 – 762), umwhile kent in the Wast bi the transliteration Li Po, wis a major Cheenese poet. He is regarded as one of the greatest poets in Cheenae's Tang period, which is often considered China's "golden age" of poetry. 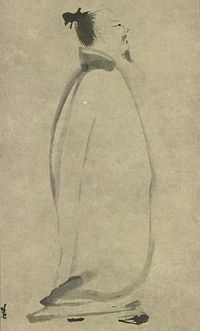 He was part of the group of Chinese scholars called the "Aicht Immortals o the Wine Cup" in a poem by fellae poet Du Fu. Approximately 1,100 poems attributed to Li Bai remain the day., including thirtie-fower in the popular anthology, Three Hundred Tang Poems. Li Bai travelled extensively "looking for patrons", became well kent for his consumption o wine, served for brief periods unner the emperor, an made his livin throu his poetry. He dee'd frae illness. In China, his poem "Quiet Night Thoughts", reflecting a nostalgie o a traveller away frae hame, haes been widely "memorized by school children an quoted by adults". In the West his influences include mony translations, adaptations, an muckle inspiration. Wikimedia Commons haes media relatit tae Li Bai. This page wis last eeditit on 26 Mairch 2017, at 04:10.